 With the Fire Engine Walker Toy, toddlers learn to walk and acquire a sense of balance.  Sturdy and beautiful crafted toy with rubberwood. 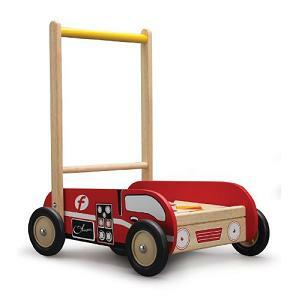 The Fire Engine Walker Toy is beautifully crafted in environmentally friendly rubberwood and bright colors and contains a storage compartment. Very cute and stury, it is also fairly heavy unlike other push and pull toys, so that your baby does not tip over. You can also adjust the tension of the backwheel, another very practical feature of this toy.